TD Bank donates annually to Turner Syndrome Foundation. You can contribute to the Turner Syndrome Foundation at NO COST! 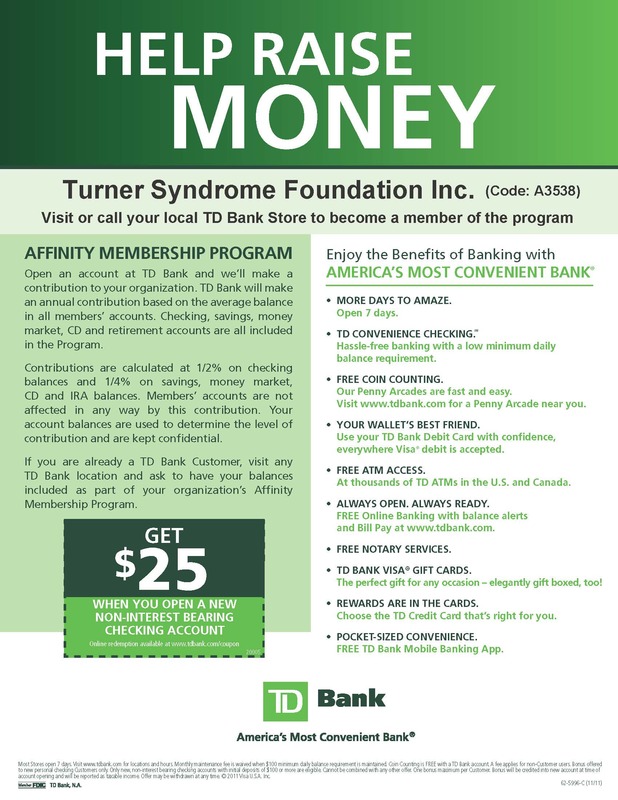 Become part of TD Bank’s Affinity Program and by doing so, contribute to the Turner Syndrome Foundation! TD Bank will donate its own money to the Turner Syndrome Foundation based on a percentage of the average balance of all linked TD Bank Affinity Program accounts. Just stop by a TD Bank Store and open an account (i.e. checking, savings, money market certificates of deposit and retirement accounts qualify) and request your account(s) balances be part of the TD Affinity Banking Program for the Turner Syndrome Foundation. Existing TD Bank customers also need to stop by your TD Bank Store to have your TD accounts added to the Affinity Program. The TD Bank Affinity Membership Program is designed to help support non-profit organizations at no cost to its members or supporters. TD Bank will make an annual donation to our organization based upon the average annual balance of all linked accounts. Eligible accounts include business and personal, Checking, Savings, Money Market, CD, and Retirement! Ask everyone to sign up! Questions? Call 1-800-594-4585. TSF will be happy to assist you! Thank you for your support! Again please note – Turner Syndrome Foundation will not receive any information from TD Bank regarding your account balances or any other personal information. This program is run solely through TD Bank and is an exciting opportunity we hope you take part in to help us continue to grow in supporting our foundation.